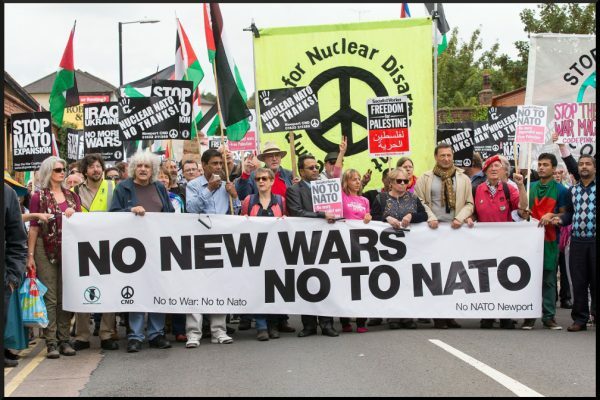 The Campaign for One Democratic State – Stop the Wars at Home and Abroad! During the horrible investigations that we went through the interrogators confessed proudly that the Mossad had assassinated Abu Jehad in Tunisia on April 16th. My husband had a deportation sentence to South Lebanon which was executed on June 29, 1989 after 18 months of “Israeli” High Court sessions and I was deported to Jordan for three years in 1990. I was allowed back to colonized Palestine with my husband and kids after the disgraceful Oslo accords. During our exile we cut all relations with the PLO leadership in objection to the negotiation process which led to the humiliating accords while the Intifada was gaining international momentum! I have always believed that the Zionist settler colonial apartheid state has a functional role to preserve and secure the interests of the global imperialist hegemony in the region and that will continue to pose both a regional and a global threat. And as the majority of the Palestinian people do, I believe that dismantling the military, security, political, economic and cultural structure of this colonial apartheid state by all forms of resistance is the only solution, not just for the Palestinian people in the Homeland and Diaspora but for the sake of peace and security of the whole region and the world. The past eight years of terrorist war waged against Syria by the imperialist aggressive camp had targeted Palestinians in Syrian refugee camps, along with their Syrian brothers and sisters, causing a second catastrophe for our people in Syria and forcing tens of thousands of them to flee from their refugee camps and out of Syria. It was obvious that targeting Palestinians and destroying their refugee camps was one of the major goals of that ugly and costly war, to abolish the Right of Return, in addition to generating sectarian division within Syria, so that the U.S. and its NATO allies can easily capture and control its natural gas and oil based on the same old colonial powers tactic of ‘Divide and Rule’. We have, as well, to emphasize that one of their major goals was to break the Axis of Resistance from Iran to Syria to Hizbullah to Palestine. What About the Campaign for One Democratic State in Palestine? The One Democratic State of Palestine solution was raised years before the unjust UN Partition Resolution 181 in 1947 but was refused by the Zionist terrorist gangs and their imperial sponsors. The Palestinian National Charter of 1968 clarified, in its 6th Article, that the Jewish community living in Palestine before the Zionist invasion are Palestinians as much as Jewish communities in the Arab countries are Arabs (regardless of the devious tactics that the Zionist Movement used to brainwash these communities that they belong to the ‘Jewish people’ not to the Arab nation; if this didn’t work they used terrorist actions to force them immigrate to the ‘Jewish State’). It clearly differentiated between the Zionist Movement (which used religious myth as a strategy for their colonial interests in historic Palestine) as part of the Imperialist aggressive camp and Jewish communities anywhere in the world; that is, between Judaism as a spiritual religion and Zionism as colonial terrorist political ideology. The PLO also called for one secular state in one of its early PNC resolutions. Both the PFLP and DFLP also called for one democratic state in historic Palestine, before they agreed on the transitional solution in 1974, one of the major mistakes by the PNC. Oppressed people cannot deal with the Zionist settler colonial power based on a transitional plan, rather we have to dismantle the whole Zionist colonial structure from its roots. The terrorist war against Syria, Iraq and the Saudi war on Yemen have played a major role in the global and regional equation of today. The global political system is no longer run by the USA in a unipolar way, but rather is witnessing the emergence of multi-polarity and regional cooperation. This includes security and financial organizations which oppose the old world organizations. In addition, the Axis of Resistance has gained momentum and has imposed a power of deterrence in face of the Zionist entity and its imperialist masters. This, of course, doesn’t mean that the USA is completely defeated; on the contrary it is still capable of destabilizing other countries with new scenarios of regime change. This can be seen in its aggressive actions against Venezuela and Iran. The U.S. led sanctions against Russia, withdrawal from the missile treaty and the commercial war against China are yet more scenarios which destabilize the global military, economic and financial system. Colonized Palestine is part of this whole dramatic change and we have to take advantage of this development. The ‘One Democratic State of Palestine’ is an initiative that opposes the two state solution, the Oslo Accords and calls on Palestinians to continue their liberation movement until they dismantle this Zionist settler colonial apartheid entity by resistance, guarantee the right of return for refugees to their villages and cities and reparation for the losses they have endured in exile, bringing the Zionist criminals to the ICC, allowing members of the ‘Jewish’ communities who want to live in historic Palestine as citizens on equal foot with the indigenous people of the country without discrimination of any kind, under the rule of law, equality before the law and the constitution. We realize that this is a long struggle process which should be based on Palestinian unity, mobilizing the people of the refugee camps all over, coordinating and learning from the Axis of Resistance, as our partners in this struggle, defeating the Zionist terrorists at home and abroad and uniting all international supporters around our national agenda. We must learn from other people’s experience in fighting the settler colonizers without kneeling to any of their devious attempts of negotiations or their Arab contractors and collaborators. For example, the Algerian people’s resistance against the French settler colonials which lasted 130 years finally succeeded with the Evian Treaty, after defeating the French colonisers. The treaty did not call for the French settlers to leave but the majority left because they couldn’t accept living in the same country on an equal footing with the indigenous people of Algeria. Finally, to accomplish this goal of ODSP we have a plan of action that works with each and every Palestinian and supporter. We are happy to coordinate with all of you; those who signed the above statement and those who are going to sign it.